Vaillancourt Folk Art Large Santa in Golden Sleigh personally signed by Judi! A Truly Wonderful Piece that Judi Vaillancourt Created and the Artists of Vaillancourt Hand Painted. Beautiful Brocade and the Reindeer in Gorgeous Brown. It measures 4 x 17 x 10 inches and is in perfect condition. 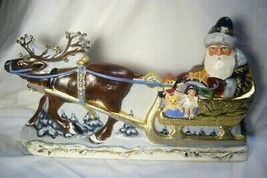 Vaillancourt Folk Art, Red Santa w/ Village Scene personally signed by Judi!